For all of you T-Mobile customers, today is a big day for you! Today is the first Tuesday to kick off T-Mobile’s promotion to thank customers, T-Mobile Tuesdays. With this promotion, which was announced during Uncarrier 11, all T-Mobile customers (postpaid and prepaid) can receive a free medium 2-topping Domino’s pizza, Wendy’s Frosty dessert, movie rental from Vudu, and even a ticket to see Warcraft in theaters. Unfortunately, as many are finding out, the T-Mobile Tuesdays app sorta blows. Riddled with stuck spinning wheels, awful login experiences, and plenty of other little bugs, it has become clear that T-Mobile and the app’s developers were not expecting this type of load on the system. 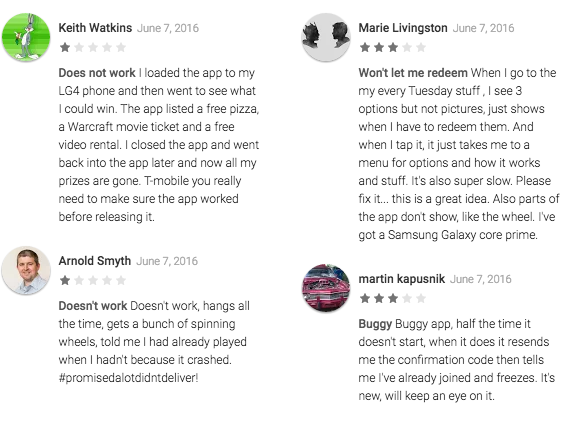 We have pasted a few of the many negative reviews from the app’s landing page on Google Play for you to see just what T-Mobile customers are currently going through. I, personally, share their frustration. After attempting to confirm that I was a T-Mobile customer, the app completely froze and locked my device. Once I got it restarted, the app shows no way of redeeming the free gifts, leaving it virtually useless at this point in time. T-Mobile will undoubtedly have to address this situation, but in the meantime, keep trying to claim your free stuff. It’s possible that once the mass of people stop trying to the use the app, the system will begin working properly. If you are on T-Mobile, go ahead and download the app and try for yourself. Good luck. Samsung Galaxy S7 Active Unboxing and Tour! Android Distribution Update for June 2016 - Marshmallow Jumps Past 10%!